Do you want straight teeth? On this page, our team has provided useful information about the ways Invisalign can help improve your smile. These clear braces are a great alternative to traditional metal braces because they are comfortable, subtle, and offer less treatment time for patients. 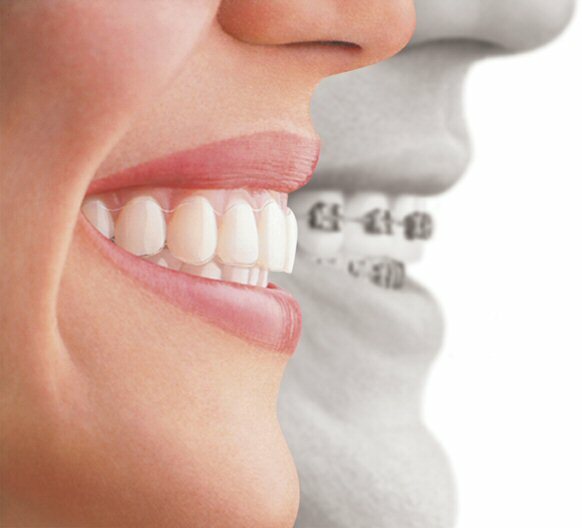 If you are near the Mesa community and interested in invisalign, we invite you to call Dr. Reyes. Very few people have straight teeth. And for years braces were the only option. To help you get a more beautiful smile, Mesa - Gilbert Invisalign Dentist, Dr. Sandra Reyes uses a series of clear, removable aligners to gradually move your teeth. You wear a set of aligners for about two weeks, removing them only to eat, drink, brush and floss. As you replace each set of aligners with the next in the series, your teeth will gradually move until they reach the position the doctor has prescribed for you. The average treatment time is about a year. Of course you want to look great, at work, at school, with friends. Maybe you speak to groups or conduct meetings. You still can. Because Invisalign is clear and nearly invisible, most people will never know you're straightening your teeth - unless you tell them. And when your course of treatment has ended, you can feel more confident, whether in front of people or not. You're going to have a stunning smile. All across the country, people like you now have great smiles and straighter teeth, thanks to Invisalign. Why not join them? Mesa - Gilbert Invisalign Dentist, Dr. Sandra Reyes is proud too offer clear braces to patients in Mesa - Gilbert, AZ and the surrounding areas. If you have questions please feel free to contact us today!